A polystyrene–divinylbenzene reversed-phase column has been used in conjunction with a mobile phase containing methylthymol blue for the separation and visible detection of Mn2+, Zn2+, Cd2+ and Pb2+ in the presence of excess concentrations of matrix metals. 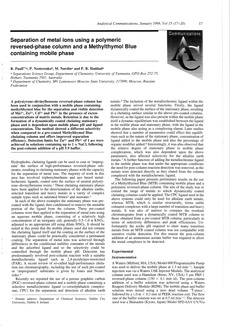 Retention is due to the formation of a dynamically coated chelating stationary phase and is dependent upon mobile phase pH and ligand concentration. The method showed a different selectivity when compared to a pre-coated Methylthymol Blue chelating column and offers improved separation efficiency. Detection limits for Zn2+ and Pb2+ of 1 µM were achieved in solutions containing up to 1 M NaCl, following the post-column addition of a pH 5.9 buffer.